With the recent announcement of Prince Harry and Meghan Markle’s engagement, it is no surprise that the first thing we got excited about was the cake! With the date set for Saturday, May 19th and fast approaching, we cannot wait to find out whether it will be a lavish nine foot spectacle, or whether the couple will go for something more modern. This got us thinking about royal wedding cakes (past and present!) and we found that where a royal wedding cake is concerned, it can never be too tall or elaborate! William and Kate’s reception on April 29th 2011, had not one but two royal wedding cakes! The official wedding cake was an eight tier fruitcake decorated with over 900 intricate leaf and floral designs, created by baker Fiona Cairns. A second cake was also created at the request of Prince William, A chocolate fridge cake, a childhood favourite of the Prince, was made by McVitie's Cake Company. The cake contained 1700 rich tea biscuits! Prince Charles and Princess Diana served 27 cakes at their July 29, 1981 wedding. Most were donated by well-wishers. 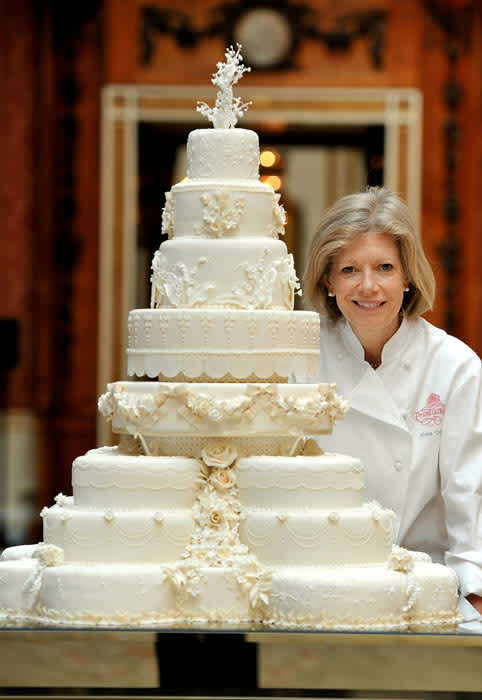 The couple's official cake was prepared by chef David Avery of the Royal Naval Cookery School. At more than five feet high, the cake was decorated with the royal coat of arms, the couple's first initials and a spray of roses, lilies of the valley and orchids. Queen Elizabeth II and Prince Philip, celebrated their wedding on November 20th 1947, with a nine feet tall, four tier cake that weighed in at 500 pounds. The cake was created by McVitie’s, the same biscuit company that went on to make a cake for Prince Williams big day. Princess Elizabeth and Philip Mountbatten’s cake was covered in ornate, cathedral-like carvings. The showstopper was complete with tiny figures, lavish columns, royal insignias and depicted scenes from the couple's lives. Prince Andrew and Duchess Sarah Ferguson served their guests a six feet tall marzipan and rum-soaked cake at their royal wedding on July 23, 1986. The cake was prepared at the navy supply school HMS Raleigh. It contained 15 ingredients, including rum, brandy and port, and was big enough to be cut into 2000 slices. Moving away from a traditional English wedding fruitcake, Prince Edward and his bride opted for a seven tier Devil's Food Cake for their June 19, 1999 wedding. Topped with tennis rackets (a reminder of the fund-raiser where the couple met), the ten feet tall confection took baker Linda Fripp and her staff 515 hours to create. 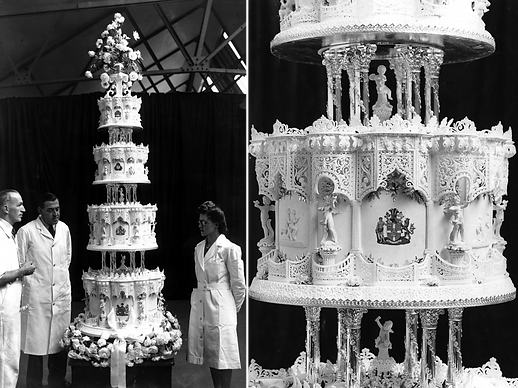 The official wedding cake of the then Prince Albert, Duke of York and Elizabeth Bowes-Lyon (later the Queen Mother) was put on display in Reading, England, on the run up to their April 26, 1923 nuptials. The public came in droves to see the ornate ten feet tall creation. Not a cake for the British Royal family, but certainly not one to be missed! On April 19, 1956, Hollywood’s favourite actress Grace Kelly wed Monaco's Prince Rainier. Their six tiered wedding cake was definitely fit for a princess. The cake was given to the newlyweds by the pastry chefs at Monte-Carlo's famous Hôtel de Paris. The upper two tiers featured a built-in cage which held a pair of live turtledoves. They were released during the cutting of the cake, done with Prince Rainier's sword. To make it even more elaborate, the creation was topped off with a revolving miniature of the bride and groom that played "Ave Maria" and Mendelssohn's "Wedding March." Are you tying the knot anytime soon? Design your own wedding cake with MY BAKER. Click here to submit your bespoke query.